Analyze your SQL Server Instances for Security Misconfigurations, and get Useful Recommendations using our Powerful SQL Server Security Tool. 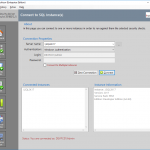 DBA Security Advisor, is a powerful SQL Server security tool, which assesses SQL Server instances against a rich set of security checks and detects potential security risks. Moreover, in the Enterprise Edition, you can get recommendations as well as remediation methods and scripts for the detected security risks. 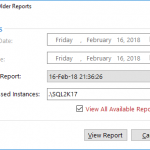 Furthermore, there is a history mechanism which allows you to track the progress of your SQL Server instances security by accessing older reports. 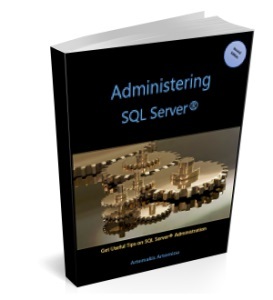 Secure your SQL Server instances today and protect your data more efficiently! Softpedia guarantees that this tool is 100% clean. 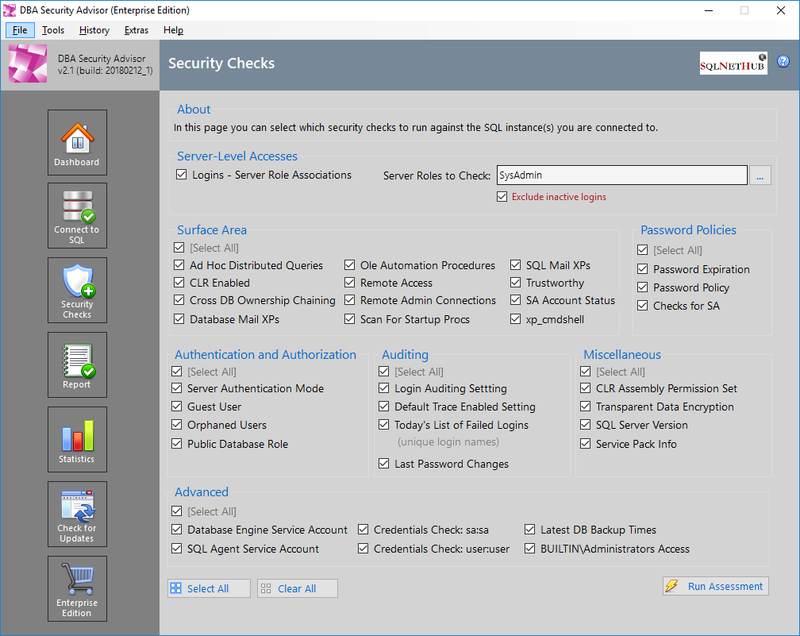 The Enterprise Edition of DBA Security Advisor features over than 30 security checks which can help you assess your SQL Server instances for potential security risks. For each detected security risk you get a comprehensive recommendation along with suggested remediation scripts and methods. 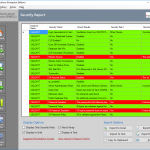 With report history you have access to the results of all scan sessions you previously ran. 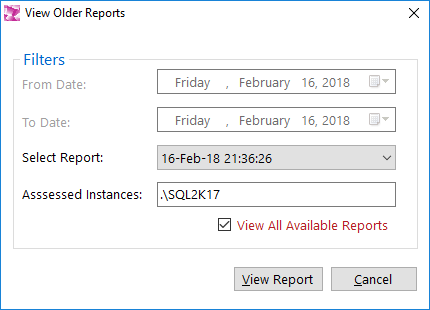 You can use older reports in order to see the progress in securing your SQL Server instances. 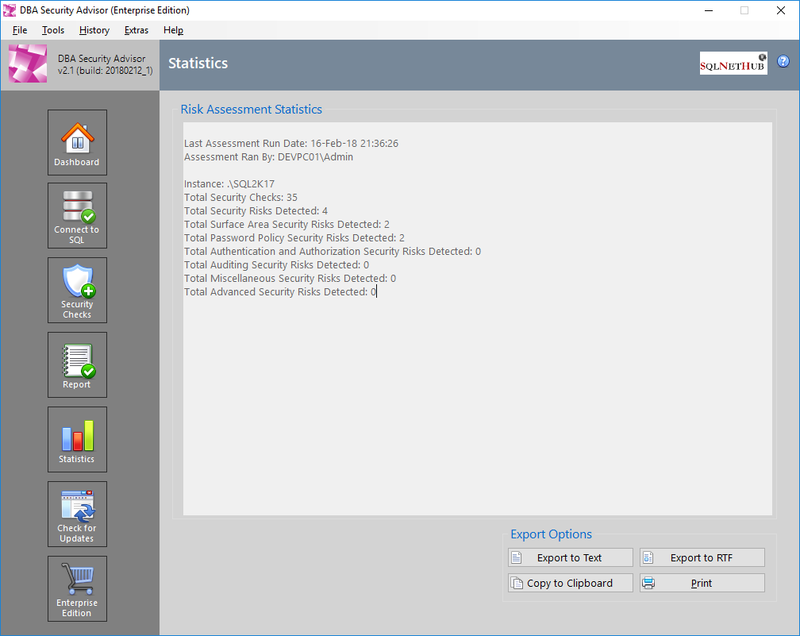 Get useful statistics for each security assessment. 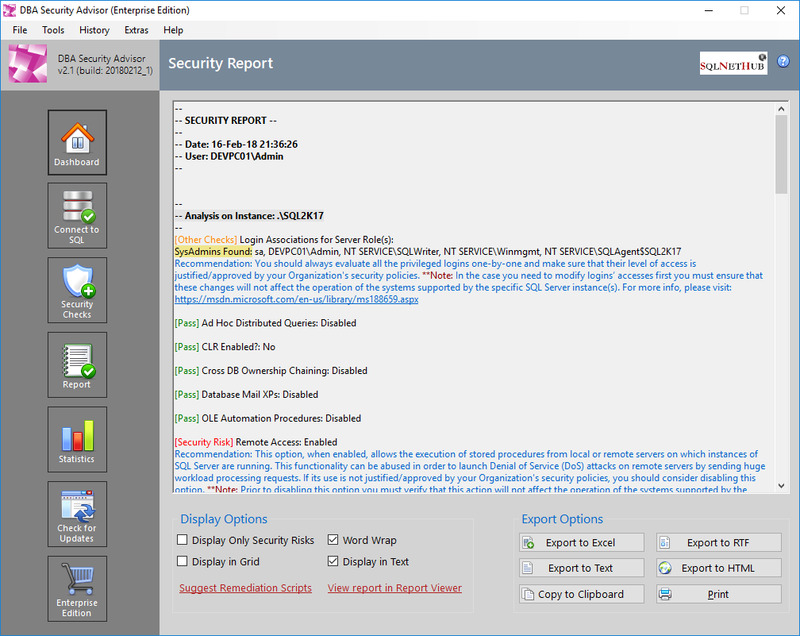 * The full set of security checks is available only in the Enterprise Edition of DBA Security Advisor. 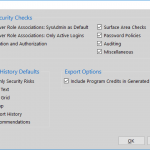 ** This set of features is only available only in the Enterprise Edition of DBA Security Advisor. 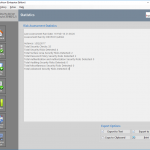 Why we Built DBA Security Advisor and How Can it Help you? You store data in your databases. Data is every organization’s most valuable asset. That is why you need to take database security very seriously. 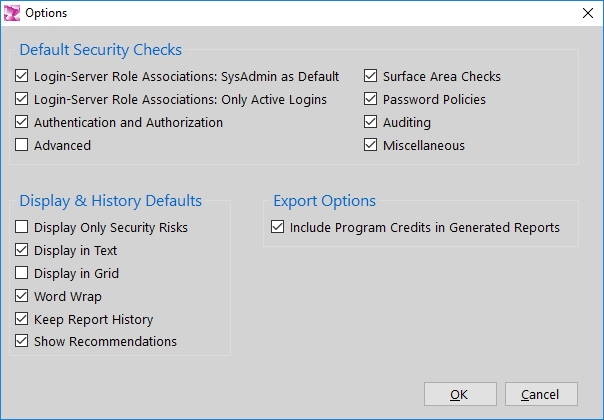 You need to prevent unauthorized access, keep your SQL Server instances healthy and patched to the latest service pack, turn off features that are not required by your operations, and the list goes on. 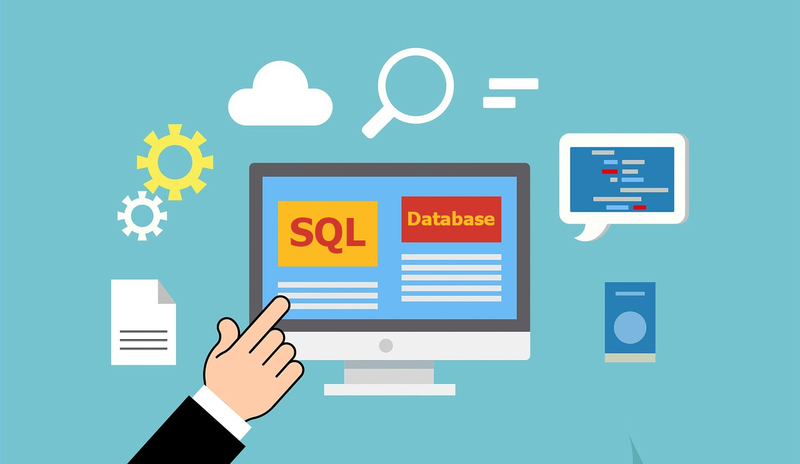 We created DBA Security Advisor in order to help you protect your SQL Server databases and in the end of the day, your data. We have included a large number of security checks and for every detected risk we provide recommendations and remediation methods. It is just like we are there and we perform a vulnerability assessment of your SQL Server instances and compile a report. We do just this via our software tool ‘DBA Security Advisor’. 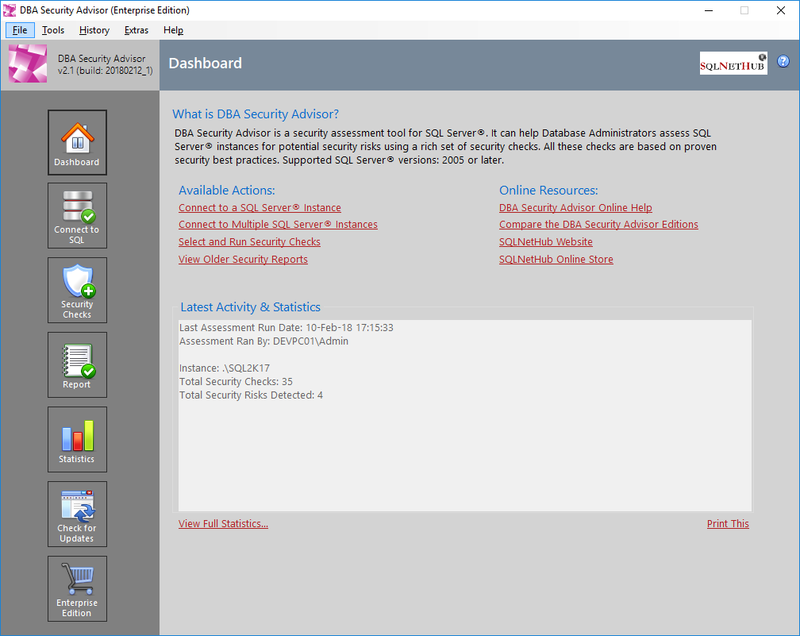 DBA Security Advisor is highly recommended when it comes to SQL Server security and protecting your SQL instances from high-risk configurations. Note: You need to have Microsoft® Excel® 2010 or later installed on the same PC on which DBA Security advisor is installed in order to be able to export to Excel. 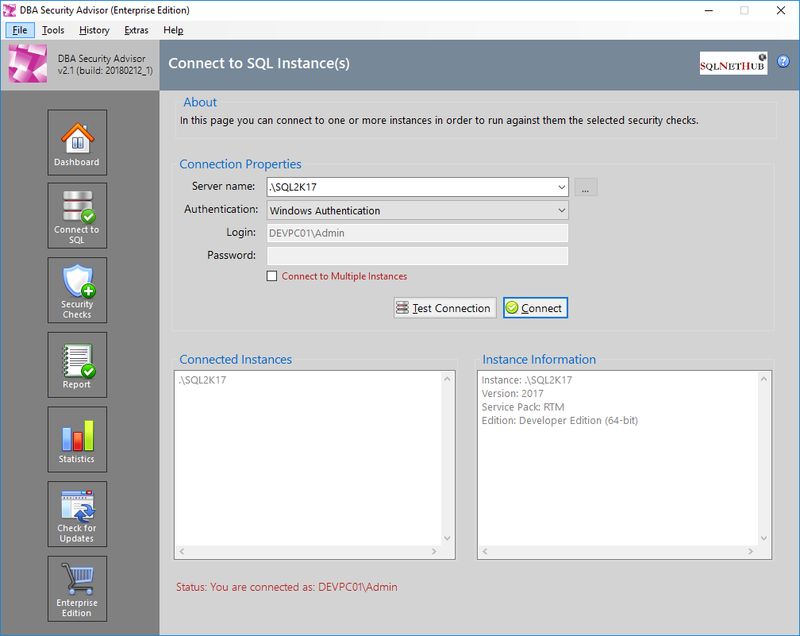 * Supported SQL Server versions: 2005, 2008, 2008 R2, 2012, 2014, 2016, 2017. 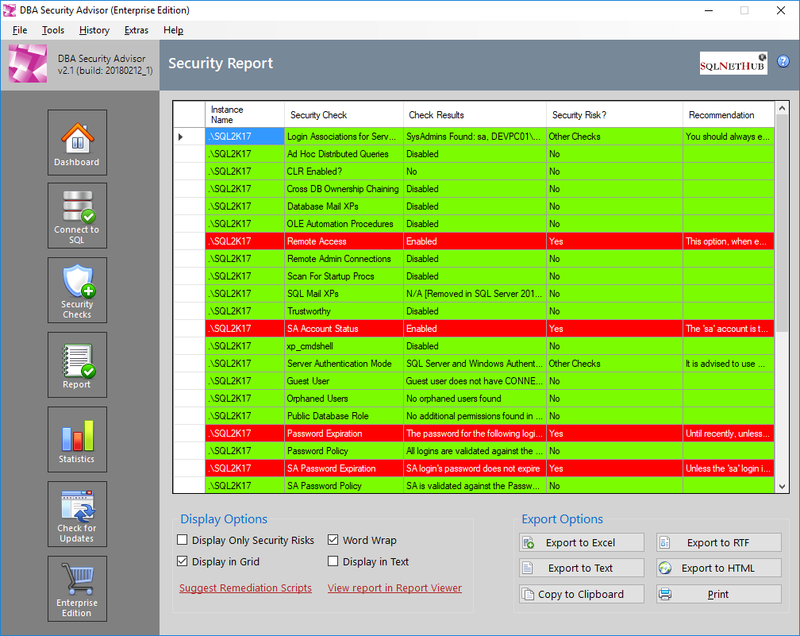 The free trial version of DBA Security Advisor, allows you to use the most of the tool’s functionality but with some restrictions and a 30-day time expiration. This 30-day free trial of DBA Security Advisor will let check the tool and see its value and usefulness. Then, you might consider purchasing the Enterprise Edition and get access to the full power of DBA Security Advisor by unlocking all features and removing all functionality and time restrictions. Purchase the Enterprise Edition of DBA Security Advisor, unlock all features and protect your SQL Server instances today! No functionality or time limitations. * For order-related help, you can reach us via the contact page. A single purchased license for DBA Security Advisor’s Enterprise Edition allows up to two (2) activations for different hardware configurations but only on the same computer. To this end, if you make extensive changes to your computer’s hardware, you can generate a new activation code and run the activation process again. This can only take place once. This means that the after you make use of the second activation (for the same computer), you will not be provided with additional free activations in case of further hardware changes to your computer. In such case, you will need to purchase a new license for the Enterprise Edition and perform a new activation (read the EULA for more info). 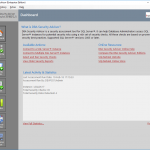 During the activation process, and after you enter the serial key that you were provided during your purchase of the Enterprise Edition license of DBA Security Advisor, you need to retrieve and submit to SQLNetHub an “Activation Code”. The activation code is a unique hardware hash (a hash is a numeric value derived through a mathematical formula and based upon some other, original value) that is created by running 2 different pieces of information from the computer’s hardware components (BIOS id, Mainboard id) through a one-way mathematical transformation. This means that the resultant hash value cannot be backwards calculated to determine the original values and it ensures complete anonymity. This process was developed in order to maintain the user’s privacy and it is only used to deter piracy. 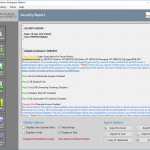 Last but not least you can find here the End-User License Agreement for DBA Security Advisor. 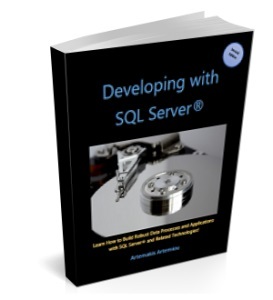 Learn how you can efficiently program in SQL Server. 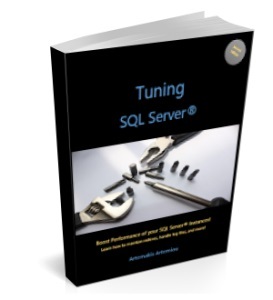 Learn about different T-SQL constructs and get useful T-SQL tips. Learn how you can work with unstructured data, data access and more.